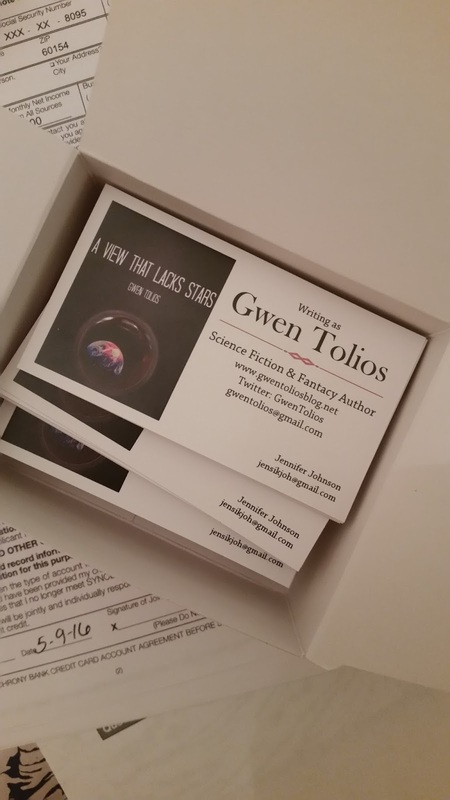 I really wanted to bring author business cards to BookCon. I had this whole pretty set up on VisitaPrint, with a mock cover and everything. Except I kept putting off ordering the cards until I had my pitch done so I could put it on the back. Actually, having as many people look at my pitch as I did was probably the wrong thing to do. 10 people give you 10 micro line edits and your driven crazy with the details. I noticed the same with my 250 word synopsis too. Regardless, I didn't settle on a pitch until last night. I really should have gone to my sister first - I tend to prioritize her opinions anyway. She's the first to rip my skin and the first to pat my head typically. What this means was my business cards had to be of the same-day printing variety. Double the cost, but oh well. There were other issues. Namely, I could only have them be one sided. Which meant I couldn't put the pitch on the back. All that waiting for nothing! I could have at least just did the cover and ordered them last week! So today was a right mess with the woman at Office Depot sending me proofs throughout the day. There was no online system for me to play with a template, design, and positioning myself. In fact, there was no template at all. I gave her vague things like "image on the left" and "real name in the bottom corner" and then we got into a back and forth game for about four hours worth of e-mails as I edited proofs. At least, at the end of it, I do have business cards. I'm not happy with them, but content, and beginning to think ordering 100 was a bit ambitious. But I must promote myself more! In writing and life! So my goal is to give away a quarter of them. And if some of them go to future blog followers instead of potential agents/editors, well that's alright too I guess. Onward to tomorrow and lots and lots of pitch practice. Just hold out your cards to people who are passing or who you're saying hello to. Force them to know who you are!